Reference number for this case: 4-Nov-54-Colmar. Thank you for including this reference number in any correspondence with me regarding this case. At approximately 06:15 a.m. a young man near the St. Joseph railway station saw a luminous object that moved in the sky above the Vosges. He reported it immediately to the employee on duty at the station ticket office, Mr. A. M., and the two men were able to watch "the strange appearance" for a few minutes. The object was "about 1 m long, trailing a long tail and it radiated a white-orange light." Many people witnessed the event. Three minutes later, the "flying cigar" "disappeared" over the Vosges mountains. Thursday morning at 6:15, when he was near the Saint-Joseph station, a young man saw a luminous object that moved high in the sky above the Vosges. He reported it immediately to the member of the staff at the counter of the station, Mr. A. M., and the two men were able to look at the strange apparition for a few minutes. The object was about 1 m long, trailing a long tail and radiated a white-orange light. Many people witnessed the event. Three minutes later, the "flying cigar" disappeared over the Vosges. At about 07:40 p.m., again from the St. Joseph station, a new shiny object was seen, much bigger than a shooting star and moving from the hospital to the Vosges, followed by a blue-red streak. Christian Valentin gathered a dossier concerning the 1954 flap in Alsace, the dossier was published in 2004 in the magazine "Les Saisons d'Alsace" published by the large regional newspaper Les Dernières Nouvelles d'Alsace. This is one of the cases he presented. On November 4, 1954 at 6 o'clock in the morning, from the Saint-Joseph station in Colmar, a young man draws the attention of the employee to an object of orange and white color follow-up of a luminous plume, which moves above the Vosges to disappear after a few minutes. St. Joseph railway station is now a halt place of the tram-train going to the Munster valley in the Vosges, rue du Val Saint-Grégoire in Colmar. The UFO is said to have been on the Vosges mountains, thus between the Southwest, West, Northwest so. 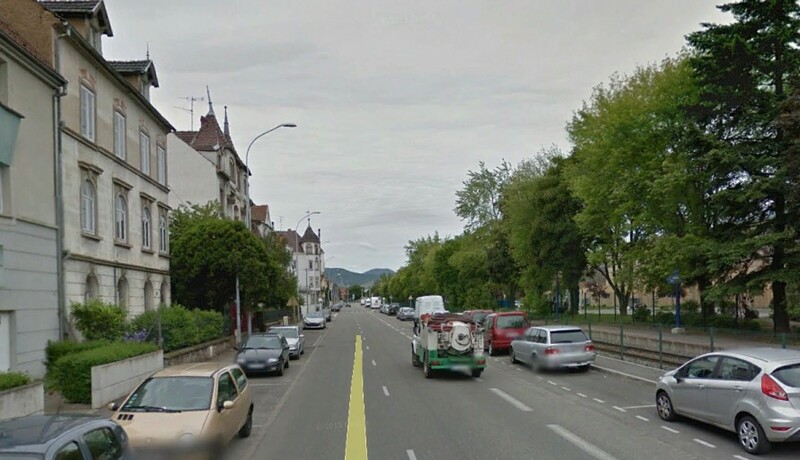 And more probably at 298°, if the witnesses were standing in the street and watched the Vosges as visible from the street (Photo below by day in 2013). That is, in a direction between Kaysersberg and Lapoutroie. The duration of "a few minutes" is probably a bit exaggerated, the most durable meteors rarely exceed two minutes of visibility. The dimension "1 m long" obviously has no value, the distance was not measured and the nature of the object was apparently unknown to the witnesses. The description is obviously the description of a meteor. [dh1] "Le cigare volant du jour", article in the regional newspaper Dernières Nouvelles du Haut-Rhin, Colmar, France, bilingual issue, November 5, 1954. [cv1] "Il y a 50 ans en Alsace et dans le monde - 1954, l'année des OVNIS", article by Christian Valentin, in the magazine "Les Saisons d'Alsace", Les Dernières Nouvelles d'Alsace publisher, #23, page 94, June 2004. [cv2] "Mythes et Réalités des Phénomènes Aériens Non Identifiés - Histoire des soucoupes volantes en Alsace jusqu'en 1980", book by Christian Valentin, Grimoires d'Alsace publishers, France, page 57, 2012. 0.1 Patrick Gross March 11, 2005 First published. 3.0 Patrick Gross May 3, 2014 Additions [dh1], [cv2], Summary. Explanations changed, were "Not looked for yet. Possible airplane, cloud..." previously.